If you don’t know who Robert Scoble is, you’re not going to understand how Internet Famous he is and why going to this lunch was like breaking bread with a rock star. 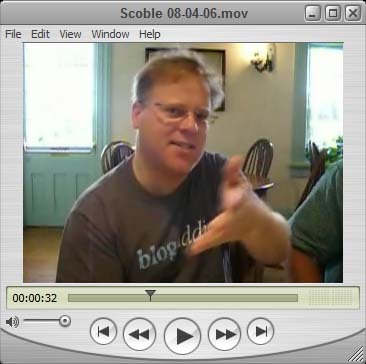 M. David Petersen made a podcast of the lunch and recorded all the amazing things that Robert Scoble had to say. I have about fifty minutes of video from the lunch. While it’s tempting to just post it all here, I’ve edited it down to just under two minutes of the coolest things that were said. This is one of those rare times where I filmed the event, but didn’t live it through the LCD screen. I was able to just hold the camera and still enjoy the moment. Some day, the camera will become so much a part of me that I won’t even realize when I’m filming. David took pictures and he snapped this photo of Mike and me. He happened to capture me looking incredibly bored and sad. I’m not bored. I swear it! Do I always look this sad? It’s not the way I was feeling, I can tell you! I was totally stoked to be there! 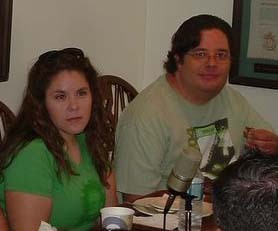 I carefully chose my shirt that morning. I wore JETRIS from Threadless. I thought a pixelated Jesus was a completely appropriate shirt for Robert Scoble’s visit to Salt Lake City, Utah. Patrick Scoble – I didn’t hear. Who are you working for? M. David Petersen – Thanks for recording the entire thing! P.S. There are three two people who came to the lunch and didn’t get on this list because I didn’t have a card. If you are one of them, contact me and I’ll put you on the list. Previous: Blue Man Group On Tour Again!